This is a reprint of the article On the Frontline of Environmental Conservation With the Sierra Club recently posted on Florida State Homes. Despite the politicization of the issue, no one living in Florida can deny the reality of climate change. More frequent and destructive storms, unprecedented high tides and storm surges, coastal erosion and flooding make it all too evident that major changes are under way. Kristine Cunningham, Vice Chair of Sierra Club Florida, says that "Climate change is affecting the whole planet with stronger storms, land lost to higher tides, flooding, and drought to name a few. Florida leads the nation in property risk from climate change and "King tides" are more frequent in South Florida and rising tides cause loss of land and invasion of salt water into fresh water." While Florida has suffered great damage due to climate change, it also has the resources for alternative energy to reduce the emissions of greenhouse gases. The climate offers unlimited potential for wind and solar energy. The development of clean energy goes hand in hand with the efforts to reduce and eventually eliminate the use of coal. Coal is the leading cause of greenhouse gas production which has already contributed to warmer temperatures including warmer ocean temperatures, rising sea levels and increased threats of flooding and storms. Cunningham says that one of the Sierra Club's most successful campaigns had been "Beyond Coal", which has succeeded in eliminating 200 coal burning power plants across the US, by closing existing plants and preventing the opening of new ones. Of the 15 coal plants still operating in Florida, two will be closed in the coming years as a result of Sierra Club efforts. Protecting and restoring the environment requires a coordinated complex of actions which include reduction of greenhouse gas emissions and other forms of air, land and sea pollution; wildlife conservation; habitat preservation; and other urgent issues like saving endangered species, clean technology, recycling and cleaning up plastics pollution. The Sierra Club is active across all these fronts. Wildlife in Florida is threatened through habitat loss and hunting. Of particular concern, says Cunningham, is the situation of panthers, Florida black bears and manatees. Black bears continue to be hunted despite the distress and opposition of local communities. Panthers are killed in road accidents in record numbers. And manatees have recently been delisted as an endangered species, and are now categorized as "threatened". This will affect them adversely, Cunningham explains, because "The manatee's listing status governs how state and federal agencies handle boating speed limits, dock and dredging permits and access to areas manatees frequent." Given its geography, location and climate, Cunningham says that "Water issues remain a high priority in Florida for the Sierra Club: protecting the Everglades, whether it's invasion of salt water into brackish water and up and down the coast, polluting the air by burning of the sugar cane remnants after their harvest; or supporting the Everglades restoration process." The Sierra Club has also opposed the Florida legislature's recent decision to allow fracking in the state to produce natural gas from questionable sources. Fracking had been shown in other states to contaminate the water supply with hazardous chemicals. 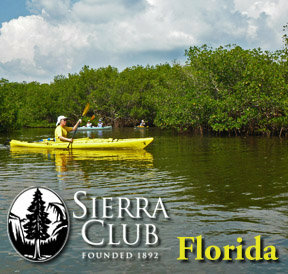 The Sierra Club's message of "Enjoy, Explore, and Protect the planet" has an urgent edge today. By joining in their work to achieve change through the political system and by educating the public, individuals can make a difference.